Aviating under difficulties is an experience that most of the pioneers who have introduced the aeroplane to outof-the-way places may well have cause to remember, as I have no doubt such men as Mr. Delfosse Badgery and A. W. Jones would bear me out were they within speaking distance. It seems, however, that the success which has been the reward of these two pilots has encouraged others to face the difficulties, financial as well as geographical, of getting an aviation industry going in Australia. This emerges from a letter from a correspondent in Western Australia, in which he advises us that a new machine has just been completed by a small syndicate at Kalgoorlie. Few details are available yet beyond the fact that the machine is a tractor biplane with a span of - upper plane 34 ft., lower plane 30 ft., area 380 sq. ft., and a speed of about 50 m.p.h. The engine is a 50 h.p. Gnome. With the exception of the motor and the wire strainers every part of the machine has been locally made, and hence the claim of the constructors that this is the first aeroplane built in Australia by Australians and of Australian material. The pilot of this new Australian machine is Mr. A. E. Geere, who will be remembered by many readers from his stay at Brooklands, where he took his "ticket" on a Vickers monoplane in, I think, September, 1912. 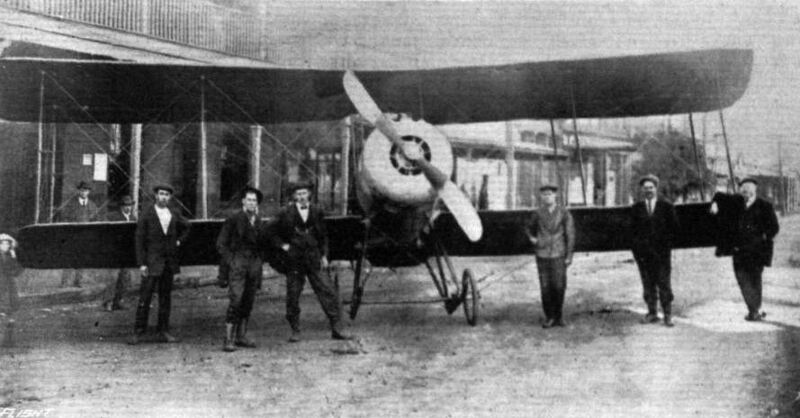 After leaving the Vickers school Mr. Geere joined the Avro school at Shoreham in June, 1913, where he was manager and instructor until the school broke up. The first flight of the new machine was from a point three miles east of Coolgardie to Kalgoorlie, where a landing was made in Bayley Street. A few days later, on June 10th to be exact, Mr. Geere attempted another trip from Coolgardie to Kalgoorlie. He had covered a distance of about eight miles when his engine began to show symptoms of lung trouble, which gradually grew worse until it coughed itself to a standstill. It was then that the first serious trouble began, for the ground below being not exactly like a billiard table, a forced landing had to be made at the first available spot, which proved to be a scrubby patch on which a flying squirrel might have made a successful landing, but not an aeroplane. However, everything considered, Mr. Geere was pretty lucky as the only damage done was a broken wing tip. A lorry was obtained on which the machine was loaded for transport back to Coolgardie, but whether it was because the horses saw a rival in the new-fangled thing on the lorry or simply from pure "cussedness," they bolted into the bush and banged the machine against the trees with such thoroughness that pretty bad damage accrued to the framework, putting it out of commission for some time. In no way disheartened, however, repairs are already well forward, and presently it is intended to make a flight from Coolgardie to Perth. Provided this is successful, it is on the cards it may help a long way towards selling one or more of the machines to the Commonwealth. One hopes that the initial hard luck will not pursue the machine in the future, and that the enthusiasts who built it may find the financial backing that will enable them to continue their good work. Some time ago, it may be remembered, mention was made in "Eddies" of a new tractor biplane with a 50 horse-power Gnome engine built by a small syndicate out in Kalgoorlie, Australia, and which was, as stated at the time, badly damaged through the horses that were hauling it away on a lurry taking fright and bolting, as horses have a happy knack of doing at awkward moments. The Kalgoorlie Aero Syndicate, which is responsible for this aircraft, comprises ten working members, the majority of whom are artisans, and the whole of the machine, with the exception of the wire strainers, was built by themselves. It is expected that it will take a couple of months to put the machine in flying trim again, as most of the work is being done during spare hours. In spite of various handicaps, all the members are setting to work with a will, and are naturally enough looking forward to the time when their firstborn will again be ready to take the air. This is the sort of spirit which deserves and will without doubt be rewarded by ultimate success. 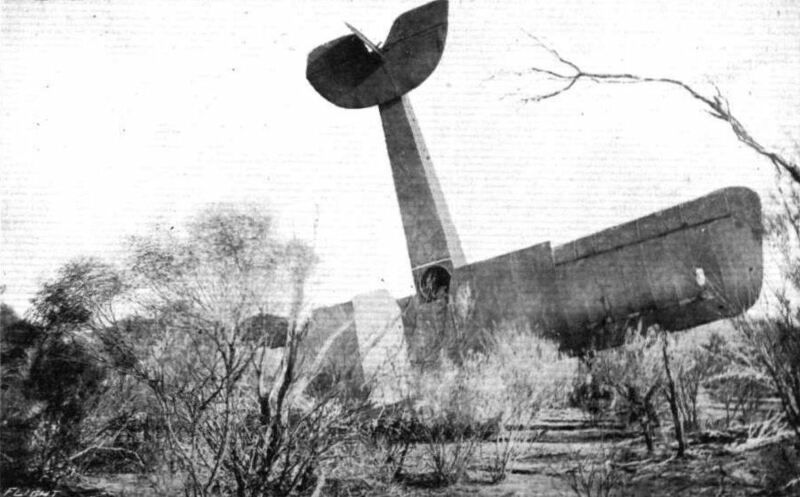 One of the two accompanying photographs shows the machine where it had landed in Bayley Street, Coolgardie, after its first flight, and in the other it is seen standing on its nose after landing in the bush owing to engine trouble. The Kalgoorlie Aero Syndicate's biplane on its nose in the bush after its forced landing through engine trouble.